This blog contains affiliate and partner links which means I will make a commission if you make a purchase using those links. See my full disclosure. Discuss these Primary lessons with other teachers when you join my private Facebook group, Primary Farm. Are you used to the new 20 minute lesson schedule yet? This week we’re teaching about John 1: We Found the Messiah. There are a few different focuses you could take on this lesson including the Creation, Plan of Salvation, Testimony, and Missionary Work. These are great to listen together in the car on the way to school. My whole family loves listening to the youth speaker ones especially. Remember, as a Deseret Bookshelf PLUS member, you can access these eBooks or audio books anytime. Find out more about Deseret Bookshelf PLUS. Jesus Makes the Earth- A simple day by day video about 2 1/2 minutes long. The Creation- Quotes from Elder Russell M. Nelson (Quorum of the 12 Apostles) about 5 minutes long. Jesus Was God the Creator- Quotes from President Gordon B. Hinckley (former President and Prophet) About 1 1/2 minutes. "Testimony" (about 19 minutes)- This is President Hinckley's General Conference talk. You could take excerpts from it to show your class. "Increase Your Testimony" (about 5 minutes)- About how the Spirit can help strengthen your testimony. "Special Witness" (about 7 1/2 minutes)- President Monson shares his testimony about the Book of Mormon, the Savior, and the prophet Joseph Smith. Member Testimonies- This page has several clips of people's testimonies. This page has even more. You could do the same thing with your ward family or group- record a few people's testimonies and share them. We Believe in Christ: Personal Testimony(about 3 minutes)- Youth share their testimonies of the Savior. These are my ideas based off the manual to help you facilitate discussion and teach specific points. Disucss how we lived in heave before coming to earth with my coloring sheet above. Bring in foil star stickers to decorate the universe! Discuss how Jesus Christ created the earth before He was born by using my Plan of Salvation chart. Discuss some other things Christ did using the chart then talk about what we might have done or will do as well. If it is warm enough, go on a walk and point out more things that God created. You can even play a simple version of I spy- "I see something green" and basically anything they say that is actually green counts. If you have an older class, bring some gloves for everyone and bags to pick up trash as you go for a walk around the building. Do a quick review of the creation. Give one of scripture posters to each person in your class and have them quickly draw what their scripture represents according to the creation of the world. Then see if they can put all their posters in order on the board. Talk about how Jesus Christ created these things before He was born on earth. Want a creation game instead? Use my creation pictionary cards for a fun guessing game. Whoever guesses correctly, should also share how that part of the creation has blessed their lives and how they feel knowing that Jesus Christ made it for them to enjoy. Use the viewer printables to do the recommended possible activity where you see a picture of Jesus. You can also use it to talk about the Plan of Salvation. Bring objects that you carry around with you regularly or that you have prominently displayed in your home that help you spread the gospel without being high pressure. Example: I used to wear a Return with Honor ring that people would always ask me about. It was an easy way to spread a little bit of the gospel and sometimes it led to a longer conversation. What are some things your class has that can easily spark a conversation to share the gospel? Have your class explain why they love the gospel and how it makes them feel. Write the key words and phrases on the board. Then ask, who do you know that would want these things too? Next, practice some ways you can easily share the gospel in an everyday conversation. Print off my Missionary Card scenarios. Draw a simple game board layout on your white board or bring one from home. Pick a card, if it’s a positive thing, have them say how that is missionary work. 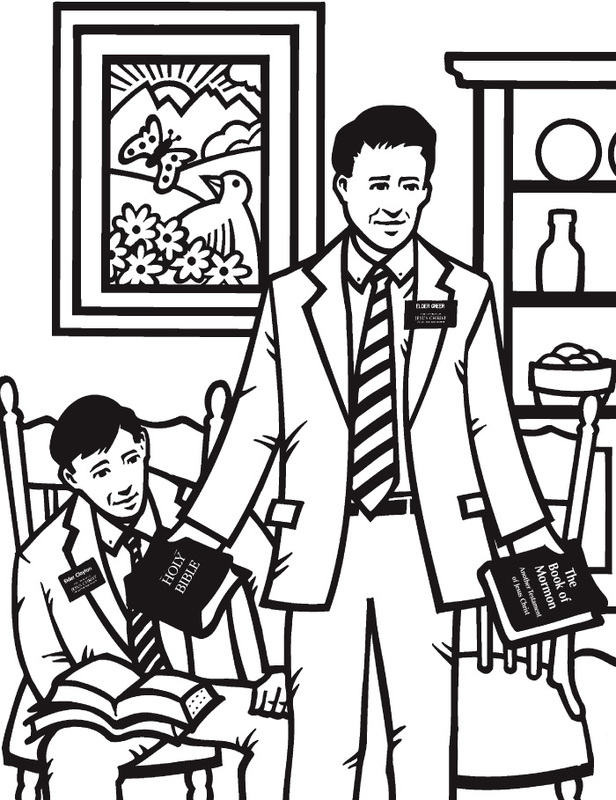 If it is a negative thing, have them say how they could make a better choice or how that hurts missionary work. Then they can roll the dice to move. Print the Come and See Poster (comes in three sizes). Cut slits to fit size of the viewer printable strip. Thread the strip through and discuss what you are seeing. Then find where else it says “Come and see” in the John 1. When can we say “come and see” to our friends and family? What do we want them to see? NOTE: the download image does not have a square on it, that’s simply to show where you might want to cut the slits. Looking for different types of handouts? 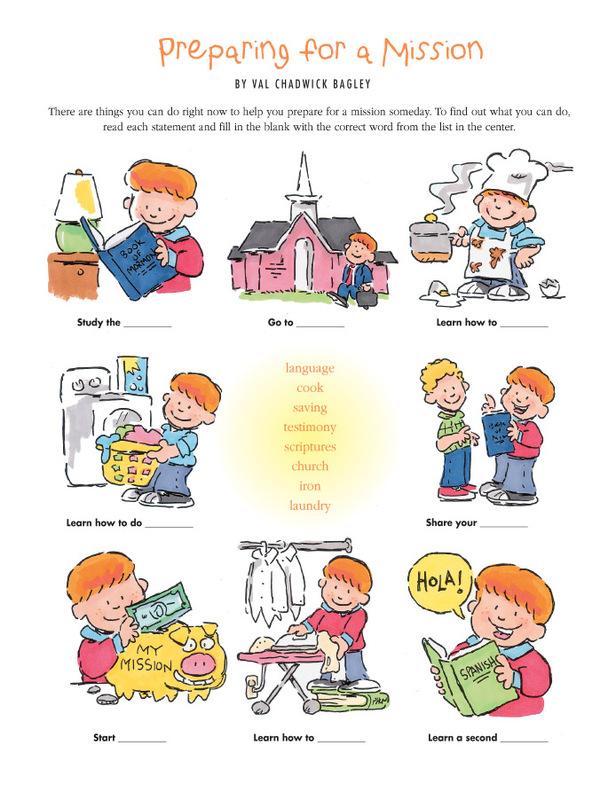 LDS messages has weekly handout packets full of additional handouts and ideas. Be sure to tell them I sent you! Need more coloring pages and activities? The Red Headed Hostess has all kinds of activities including the above coloring pages, a maze, scripture page glue ins, and more. Many of these resources are from LDS.org, however, some may be from other helpful bloggers. My Life is a Gift; My Life Has a Plan- Plan of Salvation cut outs- use for a visual or make it into a mobile. The Plan of Salvation Offers Me Peace- Put together this Plan of Salvation diagram- you could even make it into a file folder activity. Reverence for Creation- Ideas and a cut outs to color and create your own garden. The Creation-Each Day a Gift- A summation of the creation with coordinating pictures to color. Can turn them into flannel board characters or use with magazine cut outs to make a collage. My Creation Book- Print and assemble this small booklet. Creation Crossword- Scripture references given if need to look up the answers. Our Beautiful World- Draw your picture in the middle as a reminder to be grateful for the world. I Live in a Beautiful World- Circle the sense you use to enjoy the creations. When I Lived With Heavenly Father- Finish the other half of the pictures to tell the story. Gratitude for God's Creations- Look at the world through pioneer eyes with gratitude. My Father in Heaven Loves Me- Ideas and a Creation decoration to make. What Am I?- Close up pictures of God's creations to guess. "All Things Bright and Beautiful"- Pictures to color and go along with the song. Jesus Christ Created the Earth..
LDS Doctrinal Flashcards- Practice being a missionaries with these flashcards from Red Headed Hostess. Sister Missionaries- Dress up your own sister missionaries with these dress ups from Green Jell-o with Carrot. There is also an Elder version. I Will Prepare- Sign these cards saying you'll prepare for a mission or grab these super fun Future Missionary Pocket clips from LDS Bookstore. Looking for more simple images to color? LDS.org has a Primary Symbols Index by Topic that comes in handy!